Women with PCOS always have low progesterone levels. This said, the best solution to begin correcting polycystic ovarian syndrome is begin supplementing with a clinical strength bioidentical progesterone, and not synthetic progesterone, rather bioidentical naturally derived from yam or soy. Preferably yam because it is estimated that over 95% of all soy produced in the United States is now GMO/Genetically Modified by splicing a bacteria gene into the soy plant making it resistant to chemical herbicide spraying and inhibiting the gastrointestinal tract from repair. Good for the farmer and chemical companies, bad for anyone who may develop allergies. Researchers and holistic doctors believe that the rise in allergies are attributable to GMO foods, if you are already troubled with allergies please consider your choices. Progesterone is created by the ovaries, adrenal glands and adipose tissue. It is critical to understand that a woman can have her period and still not be ovulating. If she does not ovulate, she will not create the progesterone necessary to oppose estrogen and balance the effects of both estrogen and testosterone. The repeated non ovulatory cycles eventually result in fibrocystic breast disease, endometriosis, uterine cysts, bloating, weight gain, depression, hair loss on the head, hair growth on the face and other body areas, weight gain, and diabetes. Bioidentical progesterone has the same molecular configuration as the progesterone produced by the body and can be used to supplement and replace in some cases progesterone not being produced by the body and to balance estrogen and testosterone. Bioidentical progesterone has no side effects when 20 mg to 40 mg a day is used, and is the safest and most complete way to bring the symptoms of PCOS under control. Synthetic Progesterone is called Progestin and is not bio-identical. Synthetic non-bioidentical progesterone has adverse effects because the body cannot metabolize the molecule fully. Most are made from pregnant horse mare urine/Premarin...Pregnant...mare...urine. Check out premarin.org to see what this company does and how they harvest the precursor to the progesterone they make. Women with PCOS start out using progesterone daily to bring the level of deficiency into balance. This will bring the symptoms under control in a shorter period of time than cycling with it. Once your symptoms are abated and you see the sign of weight loss, and loss of thinning hair you can use; 20 mg of progesterone cream daily from day 14 to day 28 of your cycle. The disappearance of facial hair, acne and weight loss are usually obvious signs that hormones are becoming balanced, but to see these results, you'll need to give treatment three months, even though women with a good diet see changes in as little as one cycle. In conjunction with proper diet and exercise your PCOS should improve quickly enough that you will wonder why you were not told of this earlier. When your symptoms fade try gradually easing off the bio identical progesterone (take half the dose, for example) and see how it goes. If your symptoms return, stay on the full dose for six months more. Ideally, as a young woman you want to encourage your body to return to its normal hormonal rhythms as much as possible. Some women with many damaged ovarian follicles may always need to supplement with a little bit of bioidentical progesterone indefinitely. Massage the progesterone cream into your skin until it is noticeably absorbed. Bioidentical progesterone cream should not be applied over top of other body creams or perfumes as they may interfere with proper absorption. Many women who have PCOS do not experience regular menstrual cycles. Apply the progesterone cream daily for 14 days then take a 14 day break and resume the progesterone cream. Eventually the body catches on to this rhythm and begins to cycle on its own, thereby reducing the presence of cysts. 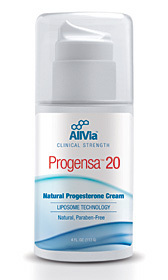 Progensa 20 is an all natural bioidentical progesterone cream made from all natural plant derived ingredients. It is non-oily, does not leave a residue on the skin, and has extremely effective absorption qualities. Under normal usage, the 1/4 pound container will last more than three months. (Certified to United States Pharmacopeia/USP grade to contain 400 mg bioidentical hormone progesterone per ounce. 20 mg per dispensing dose/or 1 pump, this is the accepted standard dose. The container contains 1600mg of the highest quality stable bioidentical hormone progesterone. This 1/4 pound container holds 90 doses of all natural bioidentical progesterone cream which will last you two months or longer.